Liz's Paper Loft: My Creative Time's October Release ~ Day 3!!! Happy Wednesday!!! Can you believe that we are on Day 3 of My Creative Time's October Release Sneak Peek!!! Friday will be here before you know, and you'll be able to see all the new sets and place your order!!! Oh my goodness, I just realized that I forgot to take a picture of the back, I had stamped "To: and From:" If only I had more time, there are so many ideas running through my head! Sneak Peek Giveaway Time!Listen up "My Creative Time" friends! We are giving all of you an opportunity to win some AWESOME prizes during Sneak peek week with a total of "6" winners to be announced during Friday's Stamp release! All you have to do is leave a comment HERE along w/the rest on the design teams blogs for a chance! These are prizes you do NOT want to miss out on!! 1. SPREAD THE WORD TO THE WORLD ON FACEBOOK about this release & whatever connections you may have! Let us know on "My Creative Time's" FB page here: http://www.facebook.com/#!/pages/My-Creative-Time/364568506334 that you did so! OR you can just tag me in your post! 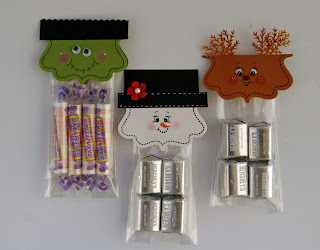 What great treat bags, they are just adorable i love how you used the die cut in a new way! so creative! these are sooooo cute!!! I love them all! thanks for sharing!! These are adorable Liz! Great minds...I was making baggies too yesterday! These are so cute. Love them. How creative with the punch! These treat bags are the greatest!!! Love them. What a FUN idea!!! Brilliant use of the dies and borders!!! those are super cute and very creative. Would be great for classroom favors or for stocking stuffers. liz these are so fun! These are soooo cute Liz!!!!!!!!!!!! Love Love Love them!! Frosty is my favourite, what a great creative idea!! 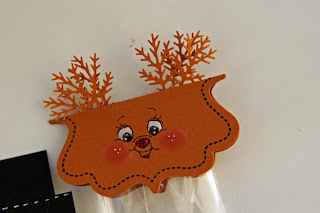 Those treat bags are adorable, I just love rudolph and his antlers, way to cute! OMGoodness! I just love these little treat bags. They are soooo cute. Fabulous!! OMGoodness these are simply ADORABLE!!!! Yum! These are AWESOME!!! The deer is too too cute! Liz, this has to be one of my favorite of all the projects I have seen so far, adorable! Fun, fun, fun AND SO cute!!! What a great little topper! Thanks for sharing that! This looks like a wonderful release. Liz, these are adorable! What a fabulous idea! Just too cute!!! So cute! The googly eyes and the flower on the snowman. CUTE!! Now I know I must get this die border stamp. Your imaginations for creating these character goodie bags. These PK stamps compliment Emma's stamps perfectly. Sweet treat bag toppers...now I want the stamps and the candy :D It all looks yummy! So cute!!! Cant wait for Friday...think I will be placing an order to get all the fun stuff that goes with the XL die! 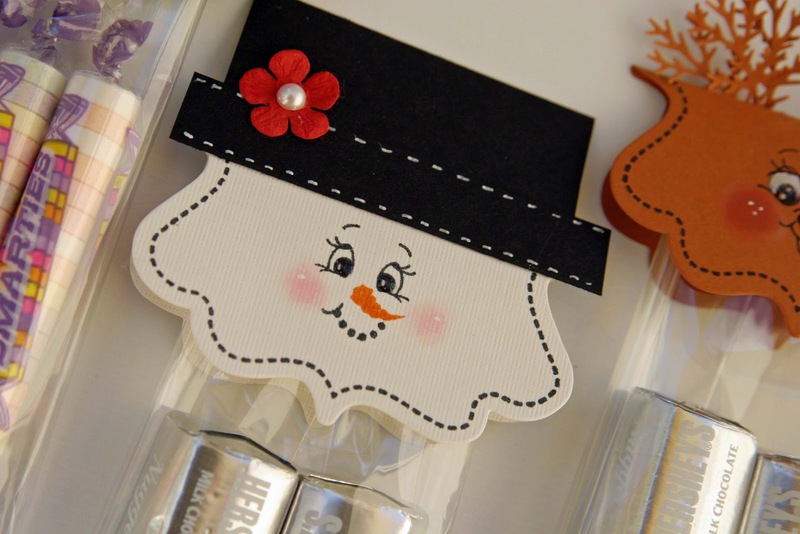 These little candy toppers are the cutest! Wonderfully cute little treat bags. i love these! they are to darn cute!! I love those treat bags with that large die cut of Emma's. Can't wait to get it. So cute! This is such a creative use of the XL Die! 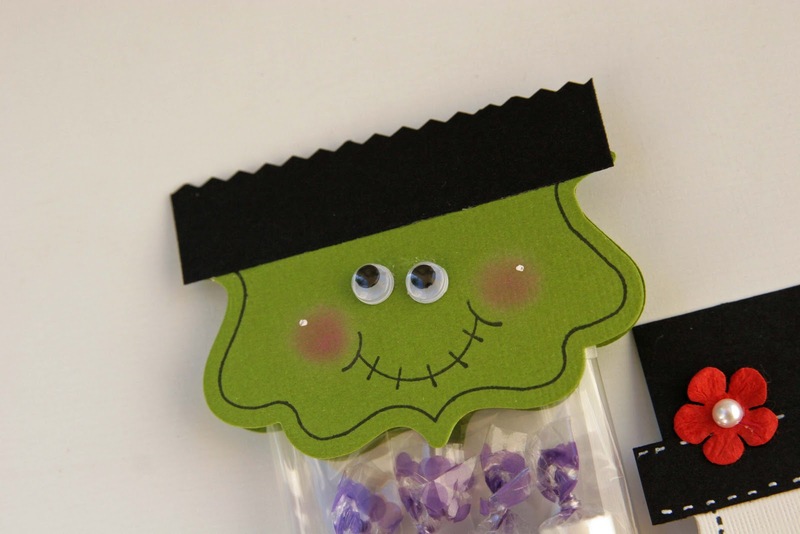 Awesome treat bag toppers! Love your creativity. Rudolph is my favorite. Great use of the branch punch for his antlers. Thanks for sharing. your cricut will forgive you, it has to if it wants to be used again. hehe these are perfectly fun. Just remembered I didn't get a chanc to come back and leave my comment yesterday. I do this hop erly and your post was not up yet so here I am.. I just wanted to tell you how wonderfu your treat bags turned out. Loved what you did with this label. Great job. TFS. I love you halloween treat , thank you for sharing. I love your treat bag holder idea. Thank you for sharing. OMG Liz! Your treat toppers are so ADORABLE!!! You are always so creative...I would have never thought to make the XL label die into cute characters like you did. Thank you for the inspiration! Miss Liz, these are super cute treat bags!!! I want a treat too! hehehehe Great use of the XL Label die and borders! I would of never thought of that! A must do project! These are super duper adorable...so cute I can't even stand it!